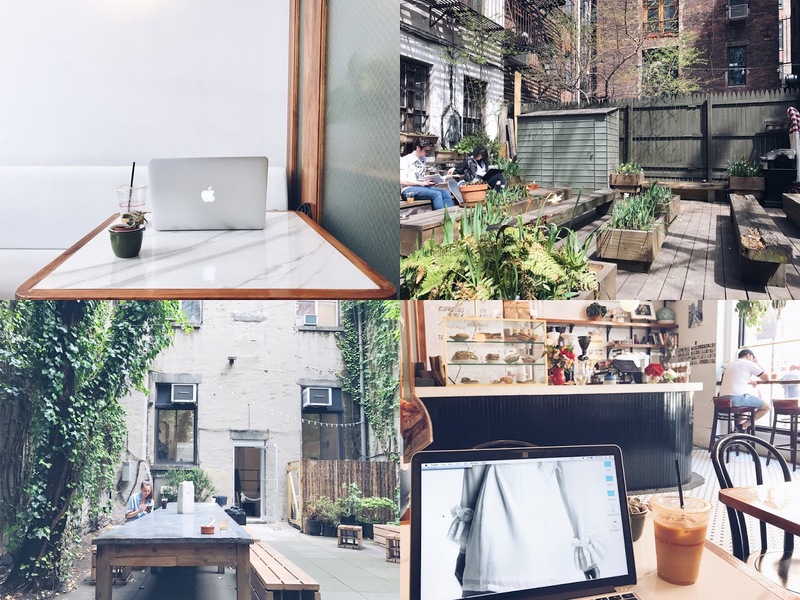 It's been a while since I told you about my favorite work spots in New York, and I've discovered a few new ones since then. If you're a student or freelancer in New York, it's always a mission to find the places with great coffees, snacks, free fast wifi and enough space. Most of the ones in this post are spring/summer proof with hidden outdoor terraces. Guaranteed productive work sessions! The Ace Hotel lobby in NYC was practically made for freelancers. Big comfy couches, communal tables, the best Stumptown coffee and free wifi. Perfect for meetings or long solo work sessions. It's really dark inside so it's perfect for a rainy/grey day. I love this place because it looks like a regular café from the façade, but when you walk all the way to the back there's a spacious back yard with large shared tables. Perfect on days where you need to work but also want to enjoy the sun. I love the iced matcha latte with oat milk and the tzaziki bowl. This is the little brother of the shop in the West Village I told you about in my previous post. This one might even be better, because they have an outside courtyard all the way in the back. There's a lot of sun and it's a little oasis of quietness, love it. This café is part of the photography museum so it's generally a pretty quiet spot, especially if you go late afternoon. Not very cozy or inspiring, but it's functional, there are no distractions and there's free wifi. Another shop with a little working space tucked away in the back. Get a coffee in the front and find a comfy seat all the way in the back. Super cozy! This is another hotel which has a café inside. Non-guests are free to lounge on the incredible terrace outside. Seriously I can't imagine a better place on a sunny day? The terrace is huge, there's sun almost all day and the wifi works well, even outside. I find the Joe & The Juice of Prince St way too small and loud (and no bathrooms), but the one on Spring St is much better. Yes, it's still loud and crowded, but at least it's very spacious and the staff is actually really nice here. My favorite juice is Joe's Roots. You might want to avoid this place around noon because it gets pretty packed. But after the lunchtime rush it turns into the perfect laptop-friendly work spot. Free wifi, nice honey-based drinks and healthy meals, in case you have a long work session. Hotel lobbies are always great to work in because you can stay as long as humanly possible, no questions asked. The Arlo Hotel also has a Joe Coffee inside which means really yummy coffee. They also have a courtyard so you could move outside on sunny days. I wouldn't recommend to sit here for hours and hours, because they basically only have three tables. But, they have some of the best coffee in the area and there's free wifi. Perfect for a quick meeting. Order the iced latte with oat milk. This place is quite small, but there are comfy navy velvet couches to lounge on and the coffee is excellent. This is a really cute little Italian café where you can get paninis and strong espressos. It's pretty relaxed on week days! It's very inexpensive and you'll feel like you're in Rome for just a couple of hours. If you liked this post make sure to check out part 1! These are also great spots for anyone visiting the city. If you're here for just a short time I'd highly recommend Greecologies, Happy Bones and Saturdays. Perfect for a little coffee/tea break!